Breakfast is the most important meal of the day because from the name itself, it breaks the fasting from a long sleep during the night until you wake up in the morning. That is why it is important that you let your kids eat breakfast everyday. This energizes them for the activities the whole day. We make breakfast for our kids everyday and sometimes, it would already look boring. So, why not try to add some creativity into it? I could remember that hubby and I used to make meals that look sweet. When I say sweet, it really just look sweet but tastes like an ordinary breakfast.lol. But the appearance differs. We form rice into letters to make I Love You or whatever we can think of. It is a surprise for both us - whoever wakes up first. But we don't do it everyday, just whenever we feel like doing it. Now that we have Bella, I tried to experiment with a breakfast for her. I actually did this for an assignment in online cooking course and I forgot to share it with you. 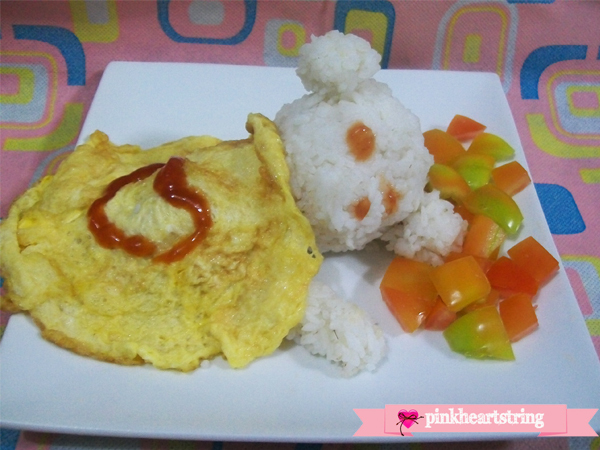 This is just comprised of rice for the bear, scrambled eggs for the blanket and some tomatoes for the pillow. When Bella saw this, she said, "Eat bear." lols. Every time she sees this picture, she would always grab my hand and ask me to cook so she can eat the bear once again. You can also do whatever you want with your kid's breakfast just to make it look more exciting. This way,they will feel excited to wake up the next day to check what is in store for them on their plates! A mother of two who has the passion for writing and arts. She is a civil engineer by profession and does different kinds of freelance work. That is adorable! My boys would love this. Aww how cute! I love finding ideas like this online - I'm not creative enough to make stuff with my food but I love "stealing" others' ideas. haha. This is so cute... and it doesn't even seem that hard to make... I love this. I will have to share it with my community! I could so see Dino digging right into this...very cool babe. thanks for sharing this foodie idea! This is super cute! I have never seen anything like this. I am pinning this for you. That is such a cute idea! My kids would ask for it all the time. Thanks for your compliments! Just a simple breakfast but was made to look yummier. Super creative idea!!!!! Love it. I have zero creativity when it comes to stuff like that! Lovely! Your daughter is blessed to have you for a mom, pinned!